Nearly two years ago, I headed to Manchester Piccadilly to close off the Northern map. It was a sad, significant day for me. It finished off a big important part of my life. Last week, I returned to Piccadilly to finish off a different part of my life. This time it wasn't quite so significant. But it was a lot happier. I descended into the undercroft of the station to finally collect the tram stop. It's the only tram stop on Metrolink that feels bigger than the network. Down there, beneath the trains, you can almost imagine you're on an underground, the underground a city the size of Manchester should have. I wasn't alone this time. While I'd finished off the Northern map by myself, and brooded, this time I'd brought along Robert and Paul to make it more of a celebration. Together we were going to visit the last few stops on Metrolink that remained uncollected - all within the City Zone. 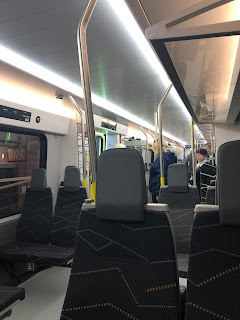 I'd started the Metrolink odyssey with Victoria, and New Islington was crossed off last August, so that left seven more: Piccadilly, Piccadilly Gardens, Market Street, Shudehill, Exchange Square, St Peter's Square, and Deansgate-Castlefield. One down. An all too brief tram ride later and we were at the next stop. We braced ourselves for Piccadilly Gardens. In recent months it's got a reputation as a sort of post-apocalyptic hell hole. Listen to the news and the city's central square is only ever talked about as a location from The Walking Dead, with spice-addicted zombies crashing through the fountains and assaulting families. Perhaps we arrived on a particularly good day, but all we saw was a sunny open space, filled with people hanging out and eating sandwiches. It was warm and open and there wasn't a single drug addicted homeless person trying to eat a pigeon in sight. We headed for the pub. It was clear that just collecting the stations would be a quick job. This has, I'm afraid, been the barrier to me really enjoying crossing off the stations on the Metrolink map. There's no effort involved. The longest walk between stops is about half an hour; miss a tram and there'll be another in a matter of minutes. It's not really been a challenge. When you've dragged yourself to Chathill on its single northbound train in the morning, then walked twenty miles, it's hard to get excited about places where you can see the next platform down the line. So, we decided to break up the day with visits to pubs. This has coincided with one of my rare moments of abstention though, so while Robert and Paul drank pints of Strongbow, I had a glass of Coke. This would be my first of many. We then walked the southern edge of Piccadilly Gardens to Market Street stop. Paul filled me in on the history of the stop while we waited for our tram. Originally it had been one way only, with a second stop, High Street, handling southbound trams. This was because it had been squeezed in alongside the traffic on Market Street. Eventually the road was pedestrianised, and the stop became bidirectional, with High Street getting demolished. (Interestingly, on the other side of Piccadilly Gardens is the site of another former stop, Mosley Street, which was demolished in 2009 to alleviate congestion. Ok, I'm using "interesting" in its broadest possible sense there). 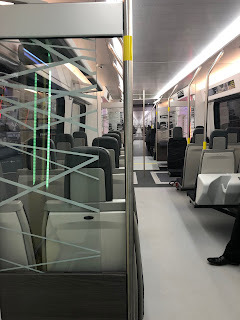 We boarded one of those trams that's been wrapped in advertising livery: great for the company, bad for the passengers, who ride a shady vehicle and peer out the window through a million dots. It skirted the edge of the Arndale - and thank you, Manchester, for keeping the name "Arndale"; Luton's abandoned it, and it is much the poorer as a result - past the is-it-run-down-or-is-it-just-fashionable? buildings of the Northern Quarter until it finally came in at the Shudehill interchange. The autumn sunlight was overwhelming here, so I finally conceded the selfie camera and got Robert to take a picture of me with the sign. Look upon my hair, ye mighty, and despair. Shudehill is a later addition to the network, opened in 2003 to connect with the new bus station at the site. It's dominated by the glittering car park, still looking remarkably decent after fifteen years. We headed down the hill, past the complex of Victorian buildings left empty by the Co-op since they moved to their big shiny testicle behind Victoria station, and emerged at Exchange Square. This whole area is now a monument to commerce, with a Selfridges and a Marks and Spencer and a Harvey Nicks alongside the restaurants of the Corn Exchange and the cinema at the Printworks. It's a regeneration project with a murky background, though; this is where the IRA detonated a bomb in 1996, leveling the area. It's a bit like the Barbican in London - a scene of appalling destruction transformed into something much better. The tram didn't arrive after the bomb, though. 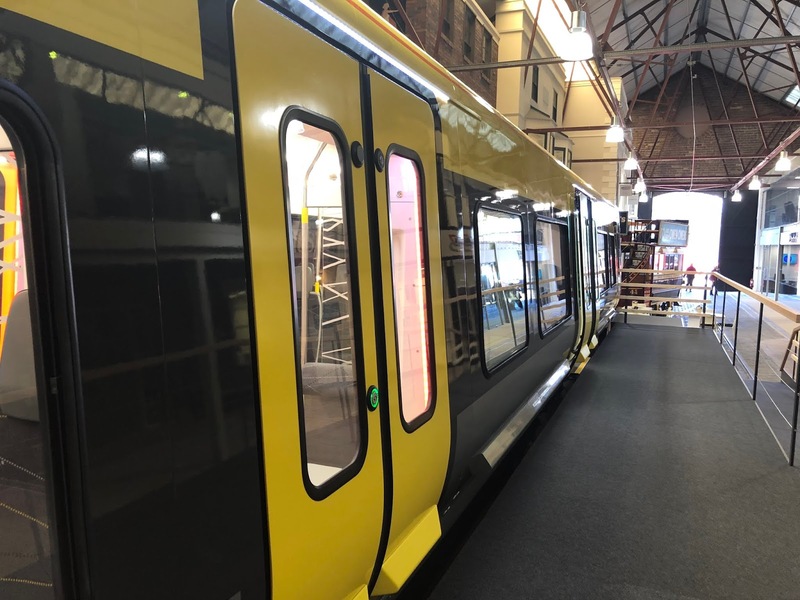 The many new arms to the Metrolink network were all funneled into a single route across the city centre from Deansgate-Castlefield to Victoria; it was a terrible strain on services and meant that a single incident could paralyse the whole system. The Second City Crossing laid down new tracks that provided a bypass and a way to spread the trams out - though it's only used by one line, the East Didsbury route, and Exchange Square was the only new stop opened, in 2015. Budding Rachel Rileys among you will have spotted that Exchange Square was the fifth of the seven tram stops we needed to collect, and it was still lunch time. Boarding a tram we came up with another delaying tactic. 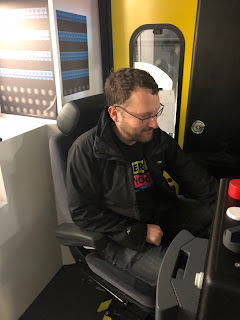 Paul suggested a brief side visit to the Museum of Science and Industry, so instead of getting off at St Peter's Square, we headed to Deansgate-Castlefield. Once known as G-Mex, this is a great tram stop to look out over the resurgent city. Skyscrapers were springing up in every direction. Cranes scraped at clouds. The stop itself still shone, the lustre of its recent rebuild to accommodate the new tracks still clinging to it. (A rebuild, incidentally, partly paid for by European money, as we were told by a plaque on the platform). We got into a bit of a debate about the station selfie. There is a huge Deansgate-Castlefield sign along the viaduct wall; Robert thought that would be a better shot than the usual platform snap. But after dozens of boring, same sign shots, I decided I wanted more of the same. Metrolink couldn't win me over with a sudden bit of extravagant branding right at the end. I would carry on with the dull, minimal sign shot. That'd teach them to put up proper signs every where. From there it was a brief walk to the collection of buildings that form MoSI. I'd been here before, of course, a couple of times, but this time we were here to see a special guest star. Stephenson's Rocket is normally housed in the Science Museum but it had been allowed to head back up north to the spot where it first blew people's minds in 1829. The world's first steam engine won the Rainhill trials and formed the engine for the initial public rail service between Liverpool and Manchester, heading across Chat Moss (and William Huskisson's leg) on the 15th September 1830. This was the engine that changed the planet. Up until its invention, human beings hadn't travelled faster than a horse could carry them; now there was a regular speedy service between two major cities. It was a little overwhelming, being stood so close to a piece of technology that so impacted the world. From that one train came a billion advances. Even the noisy children on a school trip hushed as they passed. The back end of MoSI was also the Rocket's final destination in 1830. 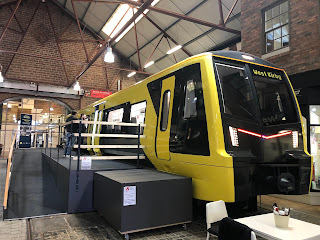 The world's first intercity railway station is preserved as part of the museum (adopted Scouser pride forces me to acknowledge that even though the trains set off from Edge Hill in Liverpool, that station was radically reconstructed afterwards). It's a plain building, more like an office block than anything else. Railway architecture hadn't been established - there wasn't an aesthetic. It used to be possible for the museum to run trains onto the mainline, but the construction of the Ordsall Chord connecting Victoria and Piccadilly sliced it off, leaving just a stub of track. None the less, you can still look down to where trains once rode in from Liverpool, to an elevated platform abutting the station building. Follow the stairs down and you reach the ticket hall. It was a little disappointing, preserved but not really utilised, hardly speaking to you. You should be thrilled by this travel back in time, not just admiring the woodworking skills. We headed back up top and out of the museum to a nearby pub for lunch. I had another fizzy soft drink. It was as thrilling as the first. That left just one tram stop to collect, but it was early, and warm, and the company was good. We decided to head to the Village for a few more drinks. Paul was more of an expert on Manchester than us, and he took us away from the roads and down onto the towpath to get there: we would take the canal to Canal Street. Despite a year of travelling all over it, Manchester remains a mystery to me. It's a shifting, elusive city. Its geography eludes me - the relationship of one station to the next, the branches of the trams running into one another. It's formless and packed. There's no central point for me to grab hold of - no river, no cathedral, no high landmark to say there, that's it. Going down onto the towpath added a new dimension of confusion. We were on the real backways now. The city whirled above us, around us, noisy and unknown. Sometimes I'd catch a glimpse of something familiar - the back of the Hacienda, a hint of the Palace Theatre - but mostly it was dark and barren and hidden. It was a new complex layer of Manchester's existence, one laced with death; the Pusher still hadn't been apprehended. Signs warned you about the perils of wandering the towpaths while drunk. I imagined wandering here after dark, cruising, taking a short cut, filled with beery bravado, and then the hands and the plummet and the silence. It was a relief to finally spot the Princess Street bridge, covered in builders from the nearby apartments, and to rise up the lock and back into familiar territory. We drank... a lot. All soft drinks for me, my teeth quietly rotting in the corner, but cider and beer and gin for Paul and Robert. We chatted and laughed and told filthy stories, then talked about trains for a bit, then usually ended up being filthy again. And finally it was dark and we headed out to collect that last tram stop. St Peter's Square twinkled. The new tram lines had forced the whole district to be rebuilt. New office blocks with ground floor restaurants took up one side, and the Cenotaph was moved to a different spot out the way. The library acquired an awful new glass entrance that detracted from its fine circular form. The Town Hall frowned down at us. Manchester is a modern city, probably Britain's second, and it rushes forward all the time. There was something strangely magical about it, that black-blue sky with the yellow tram slicing beneath. The whole Metrolink journey has been a chore at times, never quite grabbing my attention, never quite getting me excited. Now and then though the whirr of the city with its fast, efficient public transport network snakes into my soul. Trams are great, trams are wonderful, and the Metrolink is the best tram network in Britain. I've seen it all now. I love it. Which leaves one important question. What do I do now? I'm not a train nerd. I mean, I am, but I'm also not. There are whole subcategories of train nerdery. I like the stations, I like the maps, I like the lines. The actual trains? Not bothered. Are they clean and fast and quiet? Great, thanks, that's all I need to know. I do like new trains, in the sense that I like that there are new innovations and technological advances being spread onto the network. (This is one of the reasons I despise the D-Train - it's an old train that's been tarted up a bit). But I'm fascinated by new tech in general. In short, this is going to be a recap of my visit to the prototype of the new Merseyrail trains, and if you're really into rolling stock, you're going to find it very shallow and irritating. On the other hand, if you're just someone who happens to use Merseyrail on a regular basis, you might find it illuminating. The first impressions are very good. We were greeted by a member of Merseyrail staff, who proudly showed off the new features. One of the most notable is also one of the most controversial - customer operated doors. These are one of the causes of the Merseyrail guards strikes that plagued the network, but they're still there. Push the button and a small step slides out to meet the platform edge; this enables level boarding for wheelchairs and prams, and is the first time it's been seen in the UK. It's also why all the stations are being closed in shifts to have their platform edges adjusted to accommodate the sliding step. On board it's as bright and shiny as you'd expect from a new train. These will be space trains, so it'll be possible to move from one end to the other with no annoying doors between carriages. Bars are provided for standing commuters. 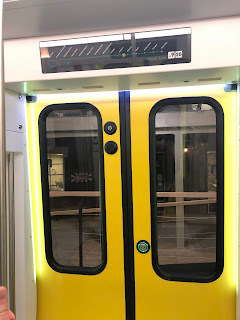 In the door vestibules there's a pole in the middle to grab hold of, though the staff lady did say the design would be changed on the real trains. At the moment it's just a single bar but people realised that on a Saturday night that'd become something for people to twirl on; it's going to acquire three outer handholds to discourage this. Looks like my dream of recreating Nomi Malone's iconic pole dance from Showgirls somewhere outside Freshfield will have to wait a little longer. The new seats are... ok. 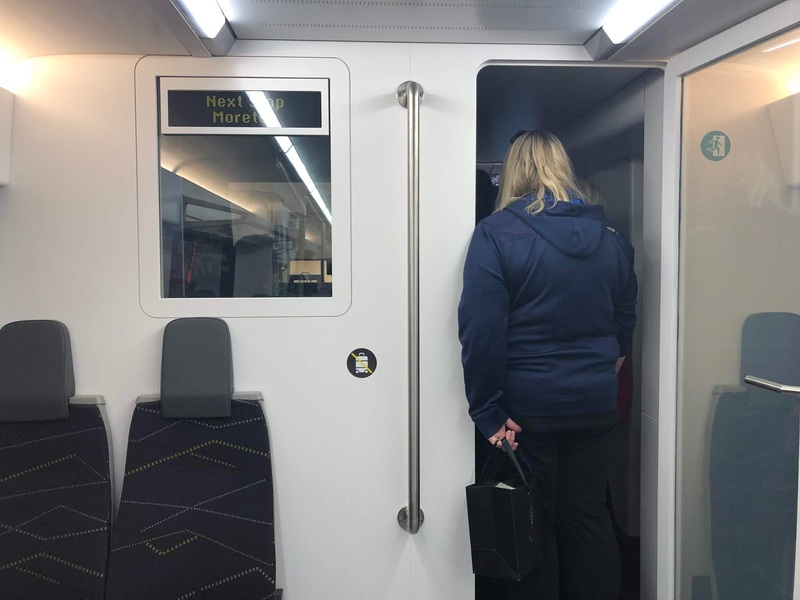 They're a mix of fours so you can sit with your mates and airline style, meaning there are more seats in every train, and they come with headrests and plug sockets and tiny tables for your cappuccino. Some of them fold up, and the single seats now face forward so that, for example, mothers can sit alongside their pushchairs. They were, in the opinion of my buttocks, less comfortable than the existing seats. They felt like they were made out of some kind of hard foam. Perhaps they'll soften with time. It looks a lot comfier than the passenger seats. My favourite feature of the new trains ("Class 777" if you're nasty) is the moving next train indicators. 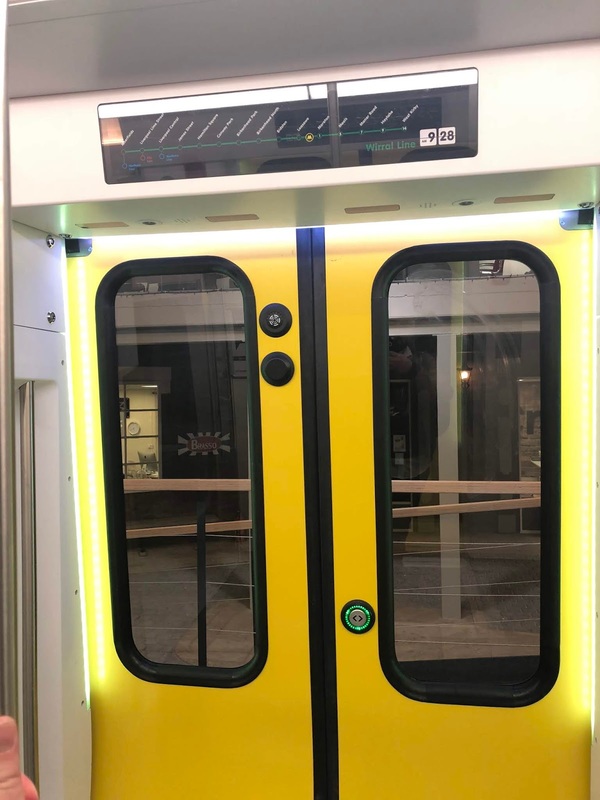 On the prototype they're just photos, but on the finished trains there will be LED screens showing the line route and updating in real time with your position. LED screens in the cabin will also tell you what the next station is, and it all looks lovely. I'm shallow like that. Stick a glowing TV screen in anything and I'm sold. The rest of the train could've been an open carriage with bench seats and I'd have been captivated by the shininess. Just to really get me excited, there'll be free wi-fi, even in the tunnels - a side benefit of the new CCTV, which is live streamed to the control centre. 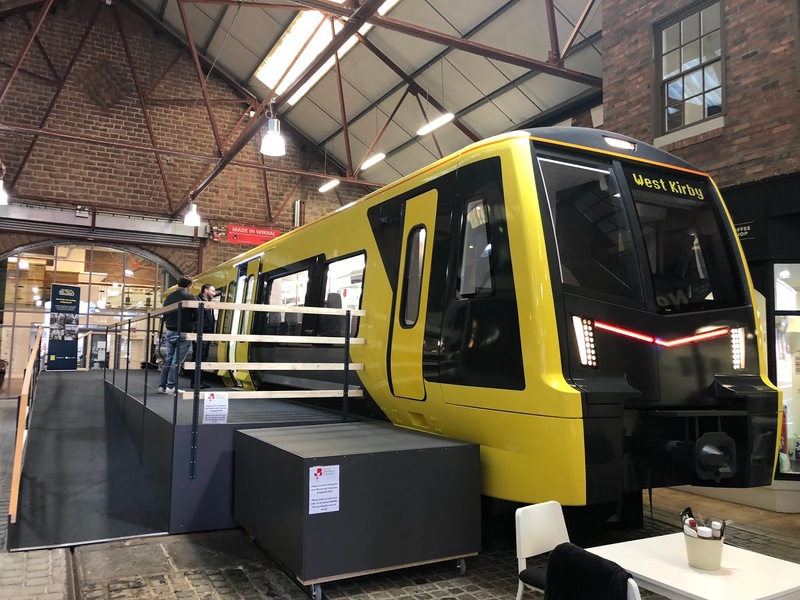 The train prototype was on display in Pacific Road in Birkenhead until today, but it will be moving to Lime Street in the near future for you to have your own gawp at it. That smiling LED at the front of the train will then be heading to a station near you in 2020. I'm quite pleased. You let me down, nerds. The comments used to be full of people demanding I go places. "When are you visiting x?" "Why haven't you done y?" There was such pressure on me to visit Yarm I actively avoided it. And yet Ilkeston? Not a word. It's been open since April 2017 and nobody has said "when are you going to Ilkeston?" No-one. Shame on you all. I decided to finally right this wrong and took an early train to the beautiful Nottingham station. It was a relief to see that it was more or less intact. The videos of the fire that hit it in January this year had looked apocalyptic. There were a few signs from East Midlands Trains asking for your patience while things were sorted out, but I couldn't see anything cataclysmic. Certainly the wonderfully restored booking hall looked just as good as it had when I'd visited three years ago. I like Nottingham. It's a really good second-tier city, and I'm not using "second-tier" as an insult in anyway. It's not Premier League like Manchester or Liverpool or Bristol; it's a large, historic city that's made its mark. It has some beautiful buildings and charming streets. It works. I followed the dual carriageway round the edge of the city centre, heading for the Ilkeston Road. I'd decided to walk all the way out to the new station rather than simply take the train there and come back. It'd be more interesting, I thought, and justify the two and a half hour journey to Nottingham. How is that still a thing, incidentally? You take a train for two and a half hours and you're still only in the Midlands. More electric trains now, please. It was ten in the morning, and the streets were mainly filled with students. So many students. Still excited at their new studies, still enthusiastic, still actually getting out of bed before lunch. They clustered together, little knots of new friends finding their way around, not realising that they'd all have new pals by Christmas and wouldn't talk to these losers again. I latched onto some bloke in Fresher's Week and we were friends until about Bonfire Night. We had literally nothing in common beside the fact that we knew nobody else and we happened to be in the same induction class. I think it was a relief to both of us when we stopped talking. It had been a steady climb up a hill out of the centre, and I paused at the top to catch my breath. Ahead of me was the stretch of the city, out into the countryside. It looked far. I'd worked out my route on the map - eight miles, two and a half hours, easy - but seeing it from there caught in my throat. That was a fair old walk. I might have reconsidered then, turned back to the station, but a white man with dreadlocks appeared at the edge of my vision, walking back the way I came. His dreadlocks went down to his waist. It was quite repellent, and I realised I couldn't walk behind that, so I carried on out of town. Fortunately the road was straight and well-maintained and interesting. It was the outer band of the city, the circle between the prestige of the centre and the rarefied suburbs, with ethnic shops and engineering firms and small backstreets. Asian grocers and barbers, redbrick houses, a slight whiff of drains and litter underfeet. Where there were building works it was to throw up four storeys of student accommodation. There were a lot of flyers for club nights, desperate to catch the new influx of 18 year olds with cheap drink promotions. The other thing there was a lot of was buses. I don't know who is in charge of public transport at Nottingham City Council but they deserve a knighthood. 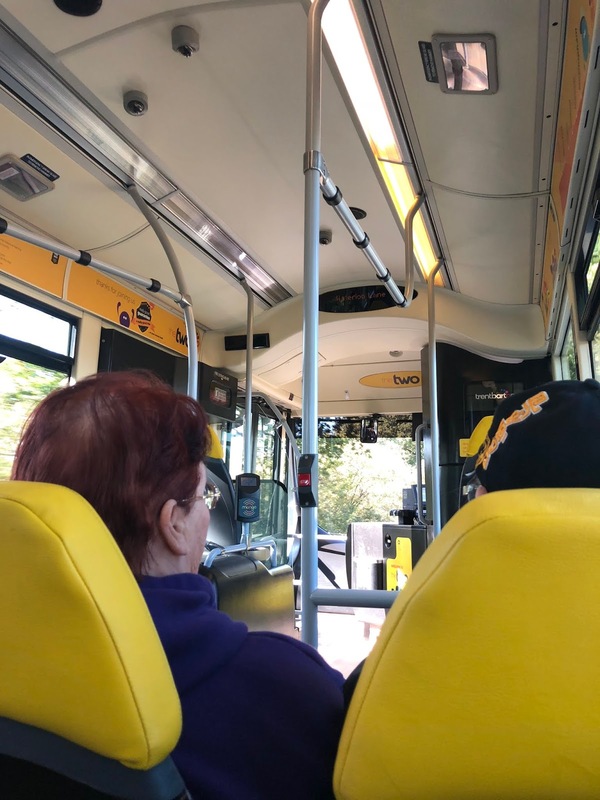 I saw frequent, efficient bus services pass me over and over that morning, calling at clean and well-maintained bus stops with a clear network map to help you. That's without mentioning the tram network, which recently got a second branch and is one of the most successful in Britain, or the effective smart card network which covers buses, trams, and trains. OK, yes, it's called the Robin Hood Network and that's a bit overdone, but if you've got an internationally renowned mythological figure tied to your city, why not exploit it? The cards are available from shops and from on-street vending machines, they can be topped up with pay as you go at the same machines, and there's an app to let you keep track of your balance. This is all fantastic. I hate to keep banging on about it, but Merseyside's Walrus still splutters on ineffectively, tied to PayPoints and only hosting a minimal spread of ticket types. Sort. It. Out. A large complex of halls of residence were accompanied by a shopping plaza that had everything a student could possibly need: Aldi, Domino's Pizza, Greggs, Subway. Chuck in a Bargain Booze and maybe, because it's 2018, a vape store, and they didn't need to walk more than twenty yards to do their entire shop. Then it was over the railway line and onto a huge double roundabout at the spot where the Wollaton Road met lengthy green boulevards flanked by sturdy council houses. It was still early, so the Crown was closed, morning light glinting off the gold, and I walked along a long strip of pre-war semis. Each one identical, white with a red roof, fake Tudor beams on the front, a tidy wall with trees. They stretched away into the distance: a welcome parade for suburbia. I was getting hungry. I'd been up since 5am; the train had left at 6:47 and the trolley hadn't turned up until after Sheffield, by which time I was too furious to order anything. I'd bought a hoisin duck wrap at the station's Co-op for my lunch and now, even though it was barely 11am, I gobbled it up. It's not a great look, a fat bloke jamming food into his mouth mid-morning, hoisin sauce dripping down his fingers, but I'd walked nearly three miles on a single yoghurt eaten six hours before. I wiped antibacterial gel all over my Chinese scented fingertips and glugged some water. By now I was on a quiet side road, paralleling the main carriageway but separated from it by a row of trees. The traffic was heard but not seen. It was bin day, and a little old lady was working her way down the street. I saw her from a distance, dragging her wheelie into her driveway, and felt a pang of guilt; that pang vanished when I realised it wasn't her bin at all. She was moving from house to house, angrily pulling the wheelie bins off the pavement and dumping them on the driveways, muttering to herself as she did so. It was a wide, quiet path - there was plenty of room to get round the emptied bins - but she was clearly determined to make a point. It was all incredibly pleasant and safe; as if to underline its relentlessly middle-class environment, a Waitrose turned up on my right, along with one of those hand car washes that plasters itself in Union flags in a way that seems to be making a Brexit-y point. You'll get none of those dedicated, working hard for the money Eastern Europeans here, it says; just a load of lazy Brits who are filled with resentment and who'll scratch your Volvo. At this point I received a visitor: anxiety. I had a train booked from Nottingham at about three o'clock. That was four hours away, and I'd already done half the walk to Ilkeston. I had plenty of time to stroll out there. But still: anxiety. That nervous, internal tap-tap-tap on my skull. The whispered voice in my head. Are you sure? Are you positive? What if you're late? Tap-tap-tap. I ran through scenarios, involuntarily, a Cassandra forced to see the doomed future. Missed trains. Stranded miles from home. Forced to buy a new ticket at walk up prices. No seat reservation. Busy rush hour services. Over and over they went in my head. I felt my pace quicken, my breath shorten, as I tried to amp up my walk. I was grimly aware that I was reaching the very edge of the city. Beyond here there would be countryside; no chance of getting an emergency taxi, no people to ask directions, maybe not even a phone signal. I pictured myself sweaty, desperate, lost, my reserved seat sliding out of Nottingham station with me miles away. The anxiety won. I couldn't walk any more. I couldn't. My walk out of the city had been regularly accompanied by the bright yellow buses of Trentbarton's Two line. They'd whizzed past every ten minutes, looking impossibly cheery under the stark blue sky, and I finally caved and waited for one. I fingered a handful of coins, filled with my usual nerves at having to deal with a surly bus driver. Once again, Nottingham came up trumps. The driver greeted me with a cheery "hello mate!". He took my payment without complaint (Merseyside's drivers frequently roll their eyes when you ask for a ticket rather than wave a pass, because it means they have to do some work). He waited until I sat down before starting the bus. He was great. He was like that with everyone who boarded. 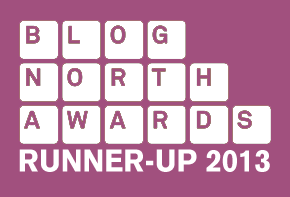 The pensioners, the young mums, the - let's say eccentric middle-aged men. Across the way, two men getting the most out of their bus pass were doing a little travel challenge of their own. There was an A-Z open on their lap, and one man fingered the route as we traveled. And the bus itself was great: clean, leatherette seats, an automated voice announcing the next stop so you could keep track of where you were headed. The driver was fast but not crazy as we went through country lines, over the county line into Derbyshire, and into Ilkeston itself. I disembarked at the bus exchange thoroughly impressed and feeling a lot jollier than if I'd walked, which is exactly the feeling you should have whenever you ride public transport. Well done, Trentbarton. Though I refuse to call you trentbarton as your website tries to make me; proper nouns have capital letters round here, thank you very much. It also meant I got to spend more time in Ilkeston, which turned out to be a delightful little town. It was certainly rough round the edges. Much of its previous wealth had been industry based, with coal works and steelworks nearby, and they were of course gone. You could feel the undercurrent of deprivation in the pound shops and the bargain stores, the slight edge of poverty in the clothes of the passers by, the whisper that this was a town that struggled. But it still carried itself proudly. There was a wonderful market square beneath the church, some pretty buildings, a tiny cinema that had probably started showing Laurel and Hardy films and hadn't stopped. It also had one of the highest concentrations of Goths I've seen outside Whitby on Hallowe'en. I'm not sure why this innocuous East Midlands town had such a large population of servants of the dead, but they seemed to be everywhere, hunkering through the streets in ones and twos. Black clad, pale, their shoulders rounded, their hair whistling around them in the autumn breezes. They didn't attract attention at all. I like Goths; I've known a few in my time, and they have been without exception some of the sweetest, gentlest people I have ever met. I would rather be on a night bus full of Robert Smiths and Siouxsie Siouxs than a load of laughing, happy "normal" teenagers. Ilkeston's were no exception. There was something weirdly charming about a teenage lad in a torn rock t-shirt, black skinny jeans and pierced face happily chatting to an old man smoking a ciggie outside the pub. I had a bit of a wander round, then headed north for the station. At one point Ilkeston had three railway stations: a junction station on the Midland Main Line, with a small branch heading into a town terminus, plus a third station to the north on the now mothballed Derby-Nottingham line. One by one they closed, until that man Beeching finally put paid to Ilkeston Junction in 1967. It left the town of more than thirty thousand people without a rail connection to the nearby prosperous city, and was obviously a ridiculous state of affairs. Still, it took fifty years for a new station to open on the edge of town. Construction was delayed by financial concerns, by reports of flooding, and by the discovery of a load of rare newts, but it finally opened in April 2017 on more or less the same site as the old Junction station. I decided not to follow the obvious route along Station Road and instead walked up Bath Street. This was where Ilkeston Town railway station had once been. It's now been completely obliterated by a by-pass, with only a wagon on the roundabout giving any hint that there used to be a railway here. I called into the Tesco superstore that now occupied the majority of the station site, partly to pay homage to the history, but mainly to have a wee, then walked out of town. As was to be expected, what had once been railway lands had been filled in the last few decades by undistinguished developments: Halfords, KFC, a 24 hour McDonalds. There was a brief recreation ground, then I was following Millership Way, a clunkily-named road laid on the route of the branch line. Cross a canal, and there it was, a long time coming for the town and for me: Ilkeston railway station. It's nothing special. Just a couple of platforms with a car park. There's no ticket office - there are machines - and as usual the most dominant architectural features are the wheelchair ramps. But it's there. Fifty years after it vanished, it's back, and it's helping the town get that little bit of connectivity and investment. It was popular too. Not just with passengers, though there were plenty of those; about half a dozen people boarded the train alongside me, which isn't bad for a Tuesday afternoon. It was also popular with train nerds. There was me, of course, larking about with my camera like an idiot. On the overbridge there was a man with a long lens pointed down the track, ready to snap a photo of the freight services that skirt the station on a passing line. And on the opposite platform was a man taking lots of shots of the station. He even had a stool to sit on. It amused me to think that we're both station nerds, and we've both got photos with each other in it, and we'll never know who the other one is. Trains that pass in the night.